A few months ago I bought a 10" Bosch Axial Glide miter saw to add to the DP shop. Since it is a heavy saw, I decided to set it up permanently as a shop saw since I already have a smaller, lighter Bosch CM8S that I use on site. The Axial Glide saw is an excellent machine with great engineering and build-quality that delivers very accurate cuts. One feature of the saw that did leave me a bit disappointed though was the dust collection capability. A lot of the saw dust seemed to escape and end up behind the saw and around it. So in true DP style, I decided to modify the saw with my own dust collection upgrades which make a world of difference. If you have been following me at all, you'll know that dust collection is something that is important to me. Collecting the dust at the source makes for a healthier work space and also saves cleanup time. For more information about shop dust collection, you can read my article here. Miter saws are notorious for producing a lot of dust that is difficult to capture. The dust collection upgrades and modifications that I came up with for my Axial Glide saw were a balance of dust collection efficiency and practical usability. To see photos of my design process and different things that I tried, visit my Instagram account. Watch the DP Shop Talk episode below to learn how the dust collection modifications work, how to make them, and see the saw in action. Below that you can download a free template for making my upgraded dust boot and also find links to some of the related products that I used. While the template is completely free, I would be grateful if you consider using any of my Amazon affiliate links below or buying a set of MPT plans, both of which help support what I do and allow me to bring you free content like this. 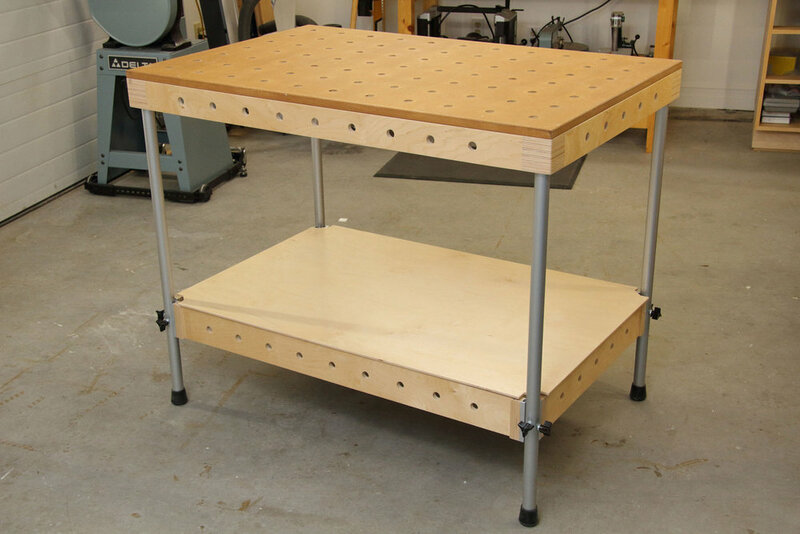 The MPT (Multi Purpose Table) is a versatile and efficient portable work table for the shop or job site. Learn more about it below and consider building one and adding it to your setup. If you have any questions or comments please leave them in the comments box at the bottom of the page. Watch the DP Shop Talk episode to learn how to make the upgrades! To make any general Amazon purchases, simply click on the link below to go to Amazon and I will receive a small commission from any items purchased. There is no extra cost to you, but using this link helps support the site. You can use the link to do your regular Amazon shopping. Any support through the use of this link is very much appreciated! Click on the button below to open the free dust boot template in PDF format, then click the Download button at the top of the screen to save it to your computer. There are printing instructions written on the template. The template contains a full scale drawing of the dust boot that can be traced onto the material that you use to make your boot. There is also a diagram showing the dimensions for bending the metal wire for a proper fit on the dust boot. With a track saw and the sacrificial cutting strips accessory, breaking down sheet goods is quick and easy.